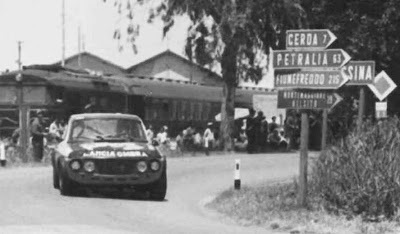 My personal hero Marco De Bartoli, pictured at the wheel and on the road from Messina, 1972. Marco drove a Lancia Fulvia. The Great Marco De Bartoli, a man who single handedly tried to revive an entire industry and a forgotten wine based solely on his longing for the sips of supernal old Marsala that he had tried as a child in his family's bodega, has passed on. When no one else cared to, Marco tried to push through initiatives to allow for higher quality wines from Sicilia, and for that he was locked out of his own winery for several years. A former race car driver, Marco used his local fame to champion the cause of layered, nuanced, and unforgettable Marsala and Passito di Pantelleria. He ran two wineries on two islands, and set the absolute high water marks at both, within the respective styles. When I think of heroic winemaking, and the sheer will to make something great in the face of absolute neglect, I think of Marco De Bartoli. He was an ardent translator of Samperi, and the only real caretaker of one of the wine world's great legacies, Marsala. Marco delivered some of Italy's most profound wines. That's right, I'm going to remember!